A discovery made in a University of Central Florida nanotechnology lab will likely become an over-the-counter cancer test in three to five years, thanks to a new commercialization grant. 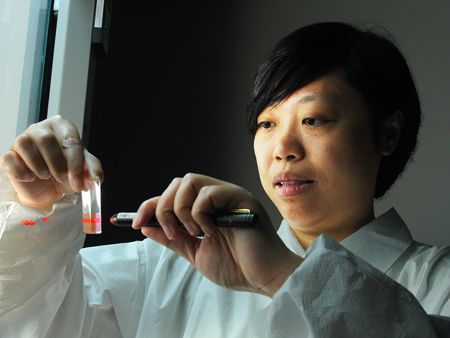 In 2009, Huo and her team developed a new technique involving gold nanoparticles to help detect cancer. She then launched Nano Discovery, Inc., a medical research bioassay company headquartered in southeast Orlando. Nano Discovery was awarded a Florida Technology Transfer and Commercialization Partnership Grant this month. The $100,000 grant will help move the team’s discovery from the lab environment to the marketplace. Huo is very excited about the progress of the research. The technique works by engineering nanoparticles to attach themselves to cancer-producing proteins related to the type of cancer that is targeted. The particles are mixed in a solution. When she places a drop of blood in the solution, the gold nanoparticles seek out the protein. If the protein is present, the gold nanoparticles cluster around it. Using a dynamic light-scattering instrument, she looks for the clusters. If there are no clusters, there is no cancer-causing protein. During a test, if cancer-producing proteins are detected at a significant level, the consumer would be directed to see a doctor. Nano Discovery expects to commercialize this new technology to the biomedical research community in one to two years and to the diagnostic market in three to five years. The company is a client of the UCF Business Incubation Program in the Central Florida Research Park.